Using both 10-meter Keck telescopes together, astronomers at the W. M. Keck Observatory have been able to peer deeper into proto-planetary disks, swirling clouds of gas and dust that feed the growing stars in their centers and eventually coalesce into new planetary systems. The team studied 15 young Milky Way stars varying in mass between one half and ten times that of the Sun and used the Keck Interferometer to obtain extremely fine observations to pinpoint the location of the processes that occur right at the boundary between the stars and their surrounding disks, which sit 500 light years from Earth. The Keck Interferometer combines both 10-meter Keck telescopes to act as an 85-meter telescope, and is a project funded by NASA, in a partnership between the Jet Propulsion Laboratory, the NASA Exoplanet Science Institute and the Keck Observatory. Four years ago, with a grant from the National Science Foundation, a quest began to expand the astrometric capability of the Keck Interferometer with a specifically engineered instrument named ASTRA, or ASTrometric and phase-Referenced Astronomy. The resolution achieved in this study, which will be published in the July 20 Astrophysical Journal, allowed the team to observe proto-planetary disk material within 0.1 astronomical units, or nine million miles, of the target star. One astronomical unit is roughly 93 million miles, or the distance between the Sun and Earth. The precision measurements would be similar to standing on a rooftop in San Francisco and trying to observe a Nene goose nibbling on a grain of rice in Hawai’i. Stars’ proto-planetary disks form in stellar nurseries when clouds of gas molecules and dust particles begin to collapse under the influence of gravity. Initially rotating slowly, the cloud’s growing mass and gravity cause it to become denser and more compact. Preserving rotational momentum, the cloud begins to spin faster and shrinks, similar to a figure skater spinning faster as she pulls in her arms. The centrifugal force flattens the cloud into a spinning disk of swirling gas and dust — eventually giving rise to planets orbiting their star in roughly the same plane. Measuring the light emanating from the proto-planetary disks at different wavelengths with the Keck Interferometer and manipulating it further with ASTRA, the astronomers were able to distinguish between the distributions of gas, mostly made up of hydrogen, and dust, thereby resolving the disk’s features. Astronomers know that stars acquire mass by incorporating some of the hydrogen gas in the disk that surrounds them, in a process called accretion. The team wants to better understand how material accretes onto the star, a process that has never been measured directly, said Joshua Eisner of the University of Arizona and lead author of the paper. 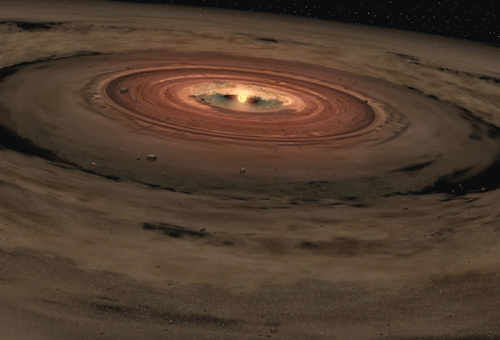 In proto-planetary disks, accretion can happen in one of two ways. In one scenario, gas is swallowed as it washes up right to the fiery surface of the star. In the second, much more violent scenario, the magnetic fields sweeping from the star push back the approaching gas and cause it to bunch up, creating a gap between the star and its surrounding disk. Rather than lapping at the star’s surface, the hydrogen molecules travel along the magnetic field lines as if on a highway, becoming super-heated and ionized in this process. “We could successfully discern that in most cases, the gas converts some of its kinetic energy into light very close to the stars,” he said, a tell-tale sign of the more violent accretion scenario. The building blocks for those more terrestrial planets could be forming now, he added, which is why this research is important for our understanding of how planetary systems form, including those with potentially habitable planets like Earth.